The U.S. Space Race in the 50s and 60s feels like such well-trodden narrative ground that it’s hard to believe there are major stories and players we don’t know anything about. This made the surprise of ‘Hidden Figures’ even greater - not only because it tells the story of women playing major roles in the NASA space program, but women of colour. These women would be heroes and legends without adding the segregation and racism of that period, so the fact that they are now part of the public consciousness thanks to this beautiful, passionate film is a real blessing and a wrong finally made right. The film focuses on three such women - Katherine Johnson (Taraji P. Henson, TV's 'Empire' and 'Persons Of Interest'), Dorothy Vaughan (Octavia Spencer, 'The Help', 'Allegiant') and Mary Jackson (Janelle Monáe, 'Moonlight'), all three intensely intelligent and highly ambitious, searching for any way to prove themselves as equal to their white male co-workers and determined to contribute to a cause they believe in so much. The film is the very definition of a crowd-pleaser, sparkling with wit, energy and heart, but this is done without compromise. It arrives at a time in cinema where the crisis of underrepresentation of both women and people of colour is very much in the forefront, and it attacks this with tremendous passion by making sure this is first and foremost Katherine, Dorothy and Mary’s story. Along with co-writer Allison Schroeder, director Theodore Melfi (who made 2014’s gorgeous ‘St. Vincent’) embraces the palpable emotional integrity of the story while injecting it with a tremendous sense of fun and energy, which both wins the audience over and intensifies the more powerful moments where these women find themselves having to justify their talents and existence against unacceptable sexism and racism. Cinematographer Mandy Walker shoots the film with an immediacy that removes sentimental nostalgia from the setting, complemented by Peter Teschner’s snappy editing that keeps the film moving at a cracking, thrilling pace. Perhaps the boldest choice though is to fill the film with original 60s-inspired songs from Pharrell Williams performed by a number of contemporary artists. In many ways it really shouldn’t have worked, but the music is so infectious and the quality it gives the film is so distinct that it completes the filmmaking slam-dunk that ‘Hidden Figures’ is. The real magic of ‘Hidden Figures’ though is in its three central performances. Henson, Spencer and Monáe are a sheer delight from the moment they appear on screen, each performance as detailed, passionate, intelligent and energetic as the other. The three of them comprise the perfect triple-act, each playing a piece in the cinematic puzzle that makes it feel even more complete - Henson’s deep emotional need, Spencer’s steely determination and Monáe’s uncompromising drive. It’s impossible to point out one performance over the other because you can’t imagine the film without any one of them. They are individually and collectively a triumph. The rest of the ensemble features fine performances from Kevin Costner, Kirsten Dunst, Jim Parsons and Mahershala Ali, but they all know this film belongs to the three leads and happily allow them to shine by giving them integral support. ‘Hidden Figures’ could have been dismissed as nothing more than a crowd-pleaser, but it embraces this quality without ever losing sight of its important goals - to tell the story of a group of remarkable women who overcame sexism and racism to become part of one of the most important moments in U.S. history. Theodore Melfi has crafted a beautiful film that feels contemporary and immediate regardless of its 60s setting, and delivered a significant blow to the current equality crisis in cinema. This is a film that fills your heart and has you leaping to your feet with joy, a testament to the human spirit and the desire to be counted as equal. It’s that rare gem of a film that manages to be tremendously important and endlessly entertaining all at once. The film is the very definition of a crowd-pleaser, sparkling with wit, energy and heart, but this is done without compromise. ‘Hidden Figures’ arrives on Blu-ray in a gorgeous 1080p 2.39:1 transfer that sparkles with colour and detail. Shot on film, the image has a beautiful organic quality which adds to its integrity, and the transfer preserves the cinematic and photographic quality of Walker’s cinematography. The transfer is complemented by a robust DTS-HD MA 7.1 track that beautifully balances the dialogue, sound design and score. You wouldn’t expect a film that appears this modest to utilise sounds as well as this film does, but when Williams’ songs kick in, those extra channels of sound certainly justify their presence. 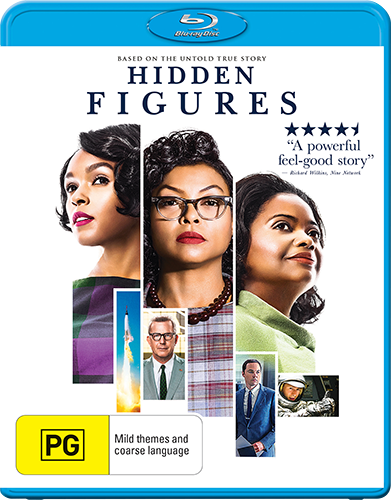 Twentieth Century Fox has included a healthy selection of extras on the Blu-ray release, the chief of which is ‘It All Adds Up: The Making of Hidden Figures’ (41:46), a terrific series of featurettes that cover the history, development and making of the film. Much of it ends up having a vague EPK feel to it, but hidden among the standard interviews are little gems of information, particularly about the historical figures that inspired the film and the way in which Melfi and Walker developed the look of the film. ‘Hidden Figures: Filming in Georgia’ (5:15) takes a further look at the locations in Virginia where the film was made, while Melfi and Henson provide a snappy, entertaining commentary filled with extra anecdotes on the making of the film. The set is finished off with deleted scenes (10:41) with optional commentary, theatrical trailer (2:25) and image gallery. The 'Hidden Figures' competition has now closed. Winners will be announced shortly. Competition opens at 5pm AEST on Sunday 28th May 2017 and closes at 11:59pm AEST on Sunday 4th June 2017. Five winners will be chosen at random on Monday 5th June 2017. To successfully win, entrants must fulfil the above entry conditions before the time the competition closes. Current members/followers are eligible to enter the competition. Only one entry per person. Only one winner per household. To be a valid winner, the entrant must not have won a prize from SWITCH within the last 28 days. Each winner will receive one Blu-ray copy of 'Hidden Figures'. By entering, you agree to receive occasional emails from SWITCH in the future. If you decide to unsubscribe from these updates, any further entries will not be applicable. Only Australian residents are eligible to enter. 'Hidden Figures' is available on Blu-ray, Digital HD and DVD on Wednesday the 31st May 2017 from Twentieth Century Fox Home Entertainment. This is truly an uplifting film. The performances from all of the leads are superb, and the inspiring true story will leave you feel like you could accomplish anything.